Life isn’t slowing down, its only speeding up! Ask a mama and they will often describe their days shuttling kids from point A to point B to point C, a taxi service to the grand adventure. Play dates, volleyball practice, swim team, ballroom dancing, guitar lessons, summer camps, friend’s houses, youth group, baseball, the snocone place, tutoring, the art store, and Chick-fil-a. That’s summer, imagine when school starts. How are the mamas feeling? Tired. Sleepy. Exhausted. Overwhelmed. Scattered. Distracted. Busy. So busy. The frazzle has become a natural state of today’s mama. They barely get a home cooked meal on the table. The laundry always finds itself somewhere between the basket, dryer and a pile at the end of her bed. The toilets need to be cleaned again and she’s sweeping the floor while calling out math facts. She may be the homeschool teacher too. Staying up late, she’s researching and organizing curriculum for the next school year, reading her bible and falling asleep in the middle of her midnight prayers. Somewhere in the mix of jumping on the trampoline with her five year old, nursing the baby and promoting the summer reading program, she’s balancing a cup of coffee and listening to a friend’s troubles on her cellphone. Nothing is easy about being a mama. As her kids run outside to ride their bike or sit on the couch to play a video game, she realizes their pants are too short and the shirts too tight. Oh yea, the kids keep growing. What about the next round of clothes? She’s trying to be resourceful, using a coupon that time at the store, recycling the milk jug, growing rosemary in the front porch flower pot, and participating in consignment sales. Those sales are amazing, but she starts to hyperventilate a little thinking about it… find hangers, cut tags, make up prices and empty the junk drawer (ok, drawers) for safety pins. $25 to participate. There is no limitation on how many items you can bring to trade. Bring 20 items, trade for 20 items. Bring 100 items, trade for 100 items. Don’t want to trade? No worries! Contribute $25 per every 20 items. Drop Off Location: Liberty Church, 2732 Old Rocky Ridge Rd, Birmingham, AL 35216. Main Entrance. Remember to bring your $25 entry fee when bringing your items. Checks can be made out to “Liberty United Appeal Fund, Inc. Please write “No More Safety Pins” in the memo line. * Keep in mind, your participation fee is not tax-deductible as you are receiving items. * Small group ladies who help us sort through the high quality items will get a shop early pass too. Sign up for your small group to help sort through donated clothing and separate the fall/winter from summer/spring. All items must be in excellent quality and not damaged. Email natalie@gracekleincommunity.com to get involved. * Secure businesses to be a business sponsor of the event and you will earn vouchers for free shopping. Email natalie@gracekleincommunity.com for details. * Promote the event through social media by following our specific guidelines and secure 10 friends to trade in early for promotional and coordination shopping perks. Email natalie@gracekleincommunity.com for details. Bag your clothing (babies, kids and maternity) and sort by size. No pricing. No safety pins. Educational games, baby gear and excellent condition shoes will also be accepted. Invite all your friends to join in. Grace Klein Community strives to build authentic community by serving and loving like Jesus. We wholeheartedly believe that meaningful, long-term relationships are a key factor in alleviating poverty. 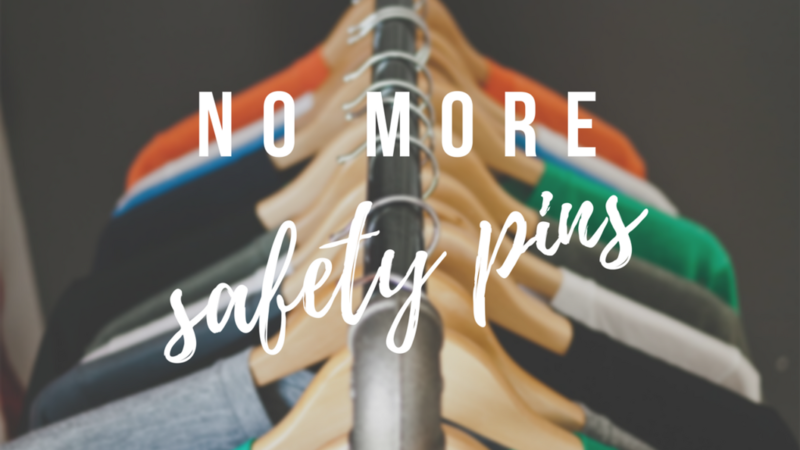 All funds raised through No More Safety Pins will benefit our local food delivery outreach program, currently serving over 245 families on a monthly basis, meeting a basic necessity by providing a healthy and nutritious food box, shared in love, resulting in lasting friendships. We need your help! Complete the volunteer sign up form below and let us know what days and times you are available to help serve.